Multicore platforms offer the opportunity for utilizing massively parallel resources. However, programming them is challenging. We need good compilers that optimize commonly occurring synchronization/interaction patterns. To facilitate optimization, a programming language must convey what needs to be done in a form that leaves a considerably large decision space on how to do it for the compiler/run-time system. Reo is a coordination-inspired model of concurrency that allows compositional construction of interaction protocols as declarative specifications. This form of protocol programming specifies only what needs to be done and leaves virtually all how-decisions involved in obtaining a concrete implementation for the compiler and the run-time system to make, thereby maximizing the potential opportunities for optimization. In contrast, the imperative form of protocol specification in conventional concurrent programming languages, generally, restrict implementation choices (and thereby hamper optimization) due to overspecification. In this paper, we use the Constraint Automata semantics of Reo protocols as the formal basis for our optimizations. We optimize a generalization of the producer-consumer pattern, by applying CA transformations and prove the correctness of the transforms. Jongmans, S.-S.T.Q, Halle, S, & Arbab, F. (2014). 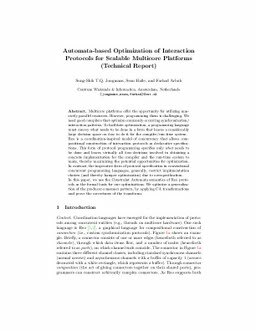 Automata-based Optimization of Interaction Protocols for Scalable Multicore Platforms (Technical Report). Formal methods [FM]. CWI.